I've always loved the look of mint and gold together. 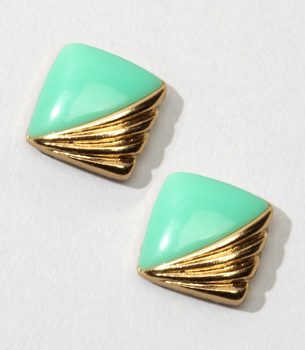 These artsy, graphic earrings are definitely very pretty. I've been looking for a nice crossover bag for a while. I love the structured design and boxy feel of this bag. The pink vegan leather, gold hardware, and delicate chain are vintage-girly, but also makes for a very functional purse that acts like a piece of jewelry. I've never been a huge animal print person, but this definitely caught my eye. The packaging of this bronzer is gorgeous and has a mix of three shades for the perfect glow for post-summer.